This berry butter is delicious! It is the perfect way to add a little extra love to your regular old pancakes or french toast. It would even be great on a muffin, a slice of bread or a biscuit and so on and so on. You can use whatever berry you like. If you hate the seeds, make sure to pick a berry without them. I used blackberries and they have seeds, but it didn't bother me. 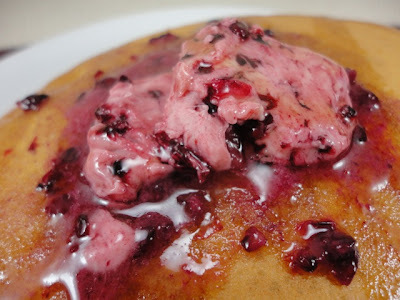 If you are going to top your pancakes with butter anyway, you might as well add some fresh flavor with some berries. Whip 2 sticks of butter with whisk attachment. Switch to the paddle and add berries. Turn on low for 5 seconds, just long enough for the berries to begin to mix in and break up (I mixed mine a little longer and that is why my butter is pink)! Turn the butter out onto a long sheet of plastic wrap set over a piece of foil. Fold over the plastic wrap and form butter into a cylinder. Continue rolling up, making sure to seal it very tightly. wrap foil around and twist edges. Freeze for at least 30 minutes, butter should be very firm. Remove from freezer and slice. Serve as desired. 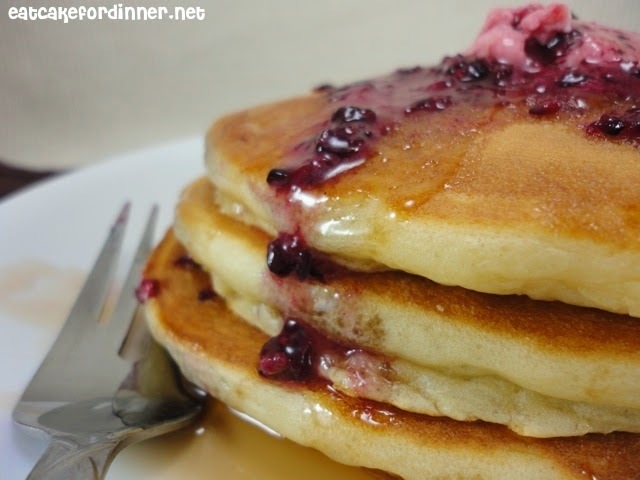 Jenn's Notes: I find it works best to set a few slices of berry butter on top of your pancakes, after you flip them, while they are still on the griddle. That way it gets warm and starts to melt. If you top your pancakes after they have come off the griddle, the butter doesn't melt as well. I love to serve mine with the berry butter and with maple syrup. Hi Jenn! A yummy recipe that would be a great topping on lots of things :) It looks so good on those pancakes!